She is now 28 years old, is healthy and a happily married mother with two children. I first met Sorn Ratha in Toul Monorum village, Kratie province, north-east Cambodia, fifteen years ago, as a UNICEF film maker accompanying programme colleagues, government officials and development partners as they conducted a comprehensive survey on iodine deficiency disorder. Sorn Ratha looked younger than her thirteen years and had a large swelling on the right side of her neck. She had no idea what it was and neither did her sisters aged nine and six, her brother aged four, nor her mother who all had similar swellings. Back then, many people used to think the swellings were caused by swallowing the hard seeds of certain fruit or by working too much. In August 2012 I revisited Toul Monorum village and met Sorn Ratha again. She is now a happily married 28-year-old and the mother of two healthy children. Her life was transformed by her encounter with the IDD team in 1997. "I didn't know what [the swelling] was until a group of official people came to visit my family and told us about this problem. Since then, I realised that almost my whole family had goitre.” says Sorn Ratha. Goitre is name for the enlargement of the thyroid when the thyroid gland is not functioning properly. It is caused by iodine deficiency. Lack of iodine can also cause brain damage, growth retardation and learning difficulties. Iodine is especially essential for women of childbearing age, because lack of it can cause miscarriage, stillbirth and mental retardation. 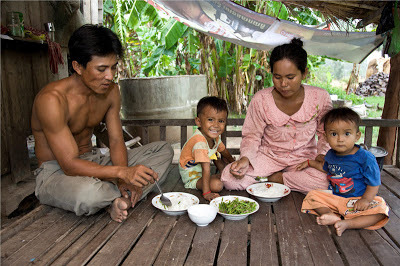 Although only small quantity of iodine is needed to prevent deficiency (just a quarter of a milligram a day) Sorn Ratha and her family had developed goitre because in Toul Monorum village along the Mekong River, there is very little naturally-occurring iodine in the soil or water. The area is exposed to heavy rainfall and periodic floods which also leach iodine from the soil, so that its crops lack this vital micronutrient. According to UNICEF Nutrition Officer, Un Sam Oeun, "When we came here in 1997…we observed that many middle-aged women and children had goitre. We could see them everywhere, on the street and in their communities." The 1997 survey found that 17 per cent of people in Cambodia had goitre (almost two million) and over five million more were at risk. As an immediate response to the high incidence of iodine deficiency disorder, the Royal Government of Cambodia adopted a strategy of Universal Salt Iodisation (USI) and stepped up the supply of iodised salt throughout the country. She cooks with iodised salt to keep her family healthy and make her children smart. With funding from United States Agency for International Development (USAID) UNICEF has continued to support the government to encourage iodisation of national salt production, enforce USI legislation, and promote the consumption of iodised salt. The strategy made a huge difference to Sorn Ratha. Without iodine her life would have turned out very differently given the inevitable impact on her physical growth and development. "The team from the organisation told us to use iodised salt in order to eliminate the goitre and we started to use it and the goiter disappeared. All of our family members got rid of goitre. I continue to use iodised salt for cooking because it makes us healthy and it improves our memory. It really caught my attention when I also heard on radio and TV that the use of iodised salt everyday makes us healthy and it makes our children smart." Sorn Ratha said. I also learned a great deal from my meeting with Sorn Ratha and her family. Having seen and documented the difference ‘before’ and ‘after’ the use of iodised salt, I can personally attest to the benefits of iodine and have never failed to urge everyone I meet to use iodised salt.